HAVE MERCY ON US ALL is a strange, twisted, gothic thriller. Impossible to categorise it is, like the very best of crime fiction, completely original. Originality is harder and harder to come across, given the volume of stuff out there, but this prize-winning book has it in spades. The plot is like nothing I've really read before, an eccentric, esoteric examination of hysteria and plague, while still managing to be a detective story too. Vargas seems to have a fascination with fear and hysteria; old mythologies, old atavistic phobias that worm their way into an old, vulnerable part of the human brain and fascinate at the same time as terrify, are placed in modern society, and she observes what happens. (Her novel, SEEKING WHOM HE MAY DEVOUR, is about werewolves.) Her subject matter is interesting; archaic and fatally fascinating. And this interest of hers in the human response to hysteria and fear is nicely relevant in today's world. The characters, too, are unlike any I've come across before. They are touched with the magical originality that lifts the rest of the book above almost everything I've read this year. An old ex-seaman who now spends his days in a small Parisian square crying out news items people drop into his box along with a coin? Genius! Elderly ex-teacher Decambrais, the man who realises the messages are warning of plague, is great fun also, and the old antagonism between he and Le Guern is oddly charming. These elderly gents behave in exactly the same way as younger people, which is nice to see. They're all an odd, eclectic, eccentric bunch. Oddly sympathetic, despite often being a rather stubborn lot. The protagonist, Adamsberg is, like the rest of them, impeccably odd; he's enigmatic, intuitive, and he carries what you sense is quite a lot of pain very close to his heart and protects it quietly and determinedly. The translation by award-winning David Bellos is what gives the icing to the cake. It's archaic, olde-worlde, brilliantly atmospheric and just as quirky as the plot and the characters. It's also a lot of fun. It helps bring across a sense of old history that's crucial to the sense of the book; a kind of melding of mediaeval gothic with universal human nature. 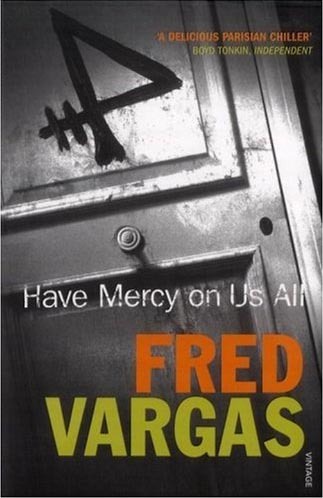 HAVE MERCY ON US ALL is a fun, disturbing, quirky, engrossing, charming, fascinating read. It's a superb crime novel, and it's no surprise to know it won a clutch of awards on the continent. I can't wait for more to be translated (and apparently there are quite a few). I can guarantee it's like nothing you've read before; to sum it up best is to say that it is very, very French. Get it now.